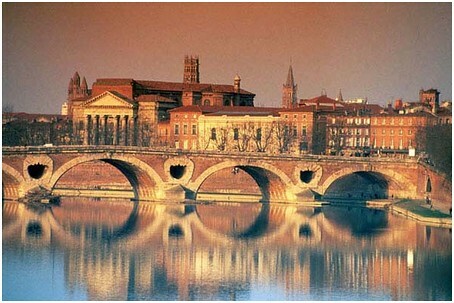 Toulouse is a city in southwestern France and is the fourth largest city in the European country. It is traditionally known as the Ville Rose or Pink City. The city boasts a number of high-tech research bases and is also the base of the Airbus airplane manufacturers. The city boasts the third largest university in France. The city has typical architecture of southern France and is the home of two UNESCO World Heritage Sites in the Canal Du Midi and the Basilica of St. Sernin. Places to visit in Toulouse include the Galerie du Chateau d’eau which is one of the world’s oldest sites dedicated to photography. There is also the Hotel d’Assezat, cathedral de Notre Dame, Hotel de Pierre, Capitole de Toulouse which is a building of great architectural importance, the Pont Neuf bridge, Jardin des Plantes, Musee des Augustins, and Les Abattoirs museum which features many contemporary paintings and art. Food is very important to the French culture and the Toulouse sausage is a specialty of the region. Other specialties include the cassoulet Toulousain which is a bean and pork stew, Garbure which is a cabbage and poultry soup and foie gras. Places to enjoy Toulousain cuisine include Les Jardin de L’Opera, Le Restaurant Adresse, and le Velane.